When it comes to colorful speech, the cowboy is a master at mixing simple images from nature with their own brand of slang. This hybrid language is an American classic and probably one of the reasons the cowboy is so warmly regarded as a true western original. 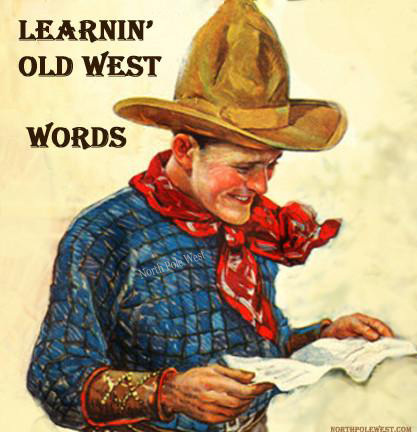 on the following pages we present a little cowboy dictionary to help you with your western education. In addition to cowboy lingo we are including other classic old west terms that were used by miners, gamblers, outlaws and lawmen. In the making of this fun dictionary it came to my attention that there are a lot of cowboy words for whiskey. I wonder what this could mean? this document has been split up into several pages and will be updated with new words from time to time so be sure and check back. Afterclaps: unexpected happenings after an event is supposed to be over. Breaking the medicine - overcoming enemy's efforts to harm you.